This doesn’t mean you should stop being helpful or charitable to homeless people you encounter on the street—but if you see this guy, there’s something about him you should know. 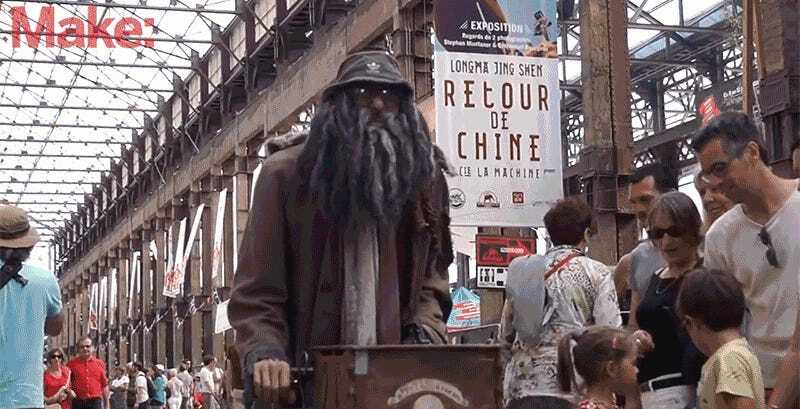 At a recent Maker Faire in Nantes, France, a man wearing worn clothing and pushing a shopping cart actually turned out to be a lifelike robotic hobo, or robo, as they prefer to be called. Dirk’s movements look realistic, mostly because we’re used to seeing homeless people who are sick or injured slowly shuffling along the street. The robot’s not autonomous, though. Its creator, Fred Abels, hides nearby, usually among the crowd of people that Dirk draws, and controls the robot like a puppet. That allows the bot to realistically interact with people, looking and nodding in their direction, and then playing an organ when someone gives it money. It’s part performance art, part social experiment, as people slowly start to realize that Dirk isn’t an actual human. But dressing it up as a homeless person serves as convincing camouflage for the robot, and helps temporarily overcome the uncanny valley that usually gives humanoid robots away. No one tell the Terminators.